In 2015, the Florida legislature established the Shared-Use Nonmotorized (SUN) Trail Network as a component of the Florida Greenways and Trails System. The SUN Trail network consists of multi-use trails or shared-use paths physically separated from motor vehicle traffic and constructed with asphalt, concrete, or another hard surface which, by virtue of design, location, extent of connectivity or potential connectivity, and allowable uses, provides nonmotorized transportation opportunities for bicyclists and pedestrians statewide between and within a wide range of points of origin and destinations, including, but not limited to, communities, conservation areas, state parks, beaches, and other natural or cultural attractions for a variety of trip purposes, including work, school, shopping, and other personal business, as well as social, recreational, and personal fitness purposes. The SUN Trail program currently receives 25 million dollars annually in funding. The Coast to Coast Trail was identified in 2015 as the first SUN Regional Trail. The Coast‐to‐Coast Trail (formerly known as the “Coast to Coast Connector”) was selected by the Greenways and Trails Council and the Office of Greenways and Trails as the highest priority trail in the state to receive SUN Trail Network funding. 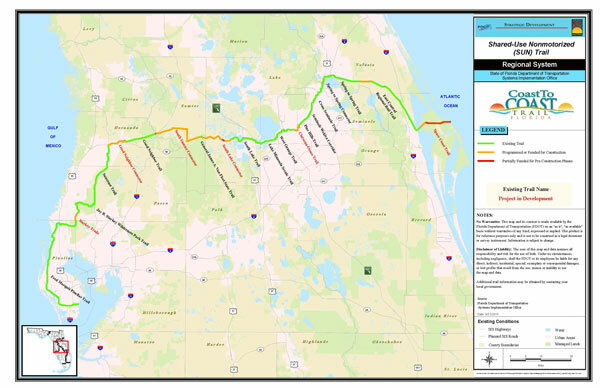 When completed, this 250-mile paved, multi-use trail will connect the Gulf of Mexico to the Atlantic Ocean and span nine counties and dozens of communities, including Hernando County and Brooksville. The goal is to utilize existing trail infrastructure and fill the remaining 75 miles of gaps to eventually allow bicyclists to ride across Florida from St. Petersburg to Titusville and the Canaveral National Seashore in Brevard County. This trail connector will be the first of its kind in Florida. The map below of the Coast to Coast Connector identifies existing segments and gaps in the system. The proposed trail will complete a gap in Florida’s Coast to Coast Trail in the Brooksville area. The proposed "gap trail" will begin on State Road (SR) 50/Cortez Boulevard, west of Cobb Road, and continue easterly through Brooksville, ending at the present beginning point for the Good Neighbor Trail near the intersection of Main Street and Russell Street. The public plays an important role in the project development and decision-making process of this study. Send us your comments and ideas to help us determine the most appropriate conceptual design for the Good Neighbor Trail.